WRI’s newest student staff member is Sarah Filippi-Field. 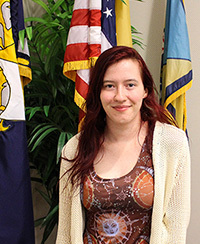 During high school, Sarah served as a Youth Representative on the Cumberland County Positive Youth Development Coalition (CCPYDC) and was an active member of the Vineland Break Out Group. She assisted the group’s Realities of Technology Campaign, which oversaw 1) the design and delivery of sexting curriculum throughout Vineland High School, 2) development of a Social Media Resource Guide for parents, and 3) organization of the Positive Uses of Social Media Competition. Sarah is studying Urban Studies and is in her second semester at Rutgers-Camden. She primarily works with the Bridgeton Break Out Group as a Project Assistant and hopes to pursue her Master’s in Public Administration after finishing her undergraduate degree. Sarah’s youthful vigor and continued commitment to South Jersey are a welcome addition to the cadre of students working at WRI. Page last updated by Senator Walter Rand Institute for Public Affairs at 3:08 pm February 28, 2017 . This page was printed from http://rand.camden.rutgers.edu/2017/02/21/spotlight-sarah-ff/ at 8:18 PM Saturday, April 20, 2019.